Then left join in your events table on both the start and end dates. This leaves you with an extrapolated table of all the days between the two dates for quick and easy aggregation. 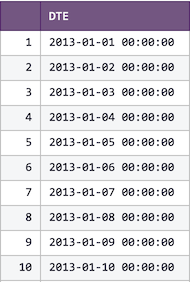 Then instead of joining to "generate_series" we join to "[all_dates]" in our subscription analysis SQL. Hope this helps! Harry Glaser , wow this is slick. Thanks for the tip here!